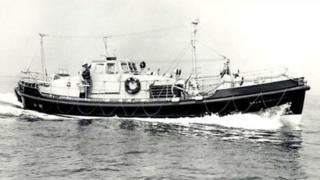 Eight crewmen who lost their lives in the 1981 Penlee Lifeboat Disaster are having a train named in their memory. The train will be named the Solomon Browne after the Cornish lifeboat involved in a disaster in hurricane-force winds, killing everyone on board. The volunteers had been trying to save the lives of eight people, including a pregnant mother and her two children. The naming of the new Great Western Railway (GWR) intercity express will take place near Penzance on Saturday. Family members of the lost crew, who were nominated by the public in GWR's 100 Great Westerners poll, will be present for the ceremony, alongside RNLI volunteers who operate the current Penlee lifeboat, the Ivan Ellen. Martin Brockman, the son of Solomon Browne crewman, Nigel Brockman, said: "We are absolutely honoured... as you can imagine there is a lot still within the station particularly us, the families that were involved in the loss of the Solomon Browne." Mr Brockman, aged 10 at the time and who last saw his father dressing in his RNLI jacket before heading out into "howling" winds, said it was "wonderful and thrilling" to know that the Penlee lifeboat crews were being honoured. On 19 December 1981 strong winds blew the cargo ship Union Star off course after it suffered engine failure. The sea was so rough that the crew of the Royal Navy Sea King helicopter were unable to airlift any of the people off. The lifeboatmen made multiple attempts to pull alongside the Union Star in what was described by one of the helicopter crew as "the greatest act of courage that I have ever seen, and am ever likely to see", before being overwhelmed by the conditions.